The water that springs up in the cold bath at the south of Mill Wood flows through various lakes, over many waterfalls, through and under wonderful eighteenth-century bridges and leaves the wood at its southern end where it then flows beneath a man-made culvert and out into the fields opposite where it retakes its form as a natural stream. 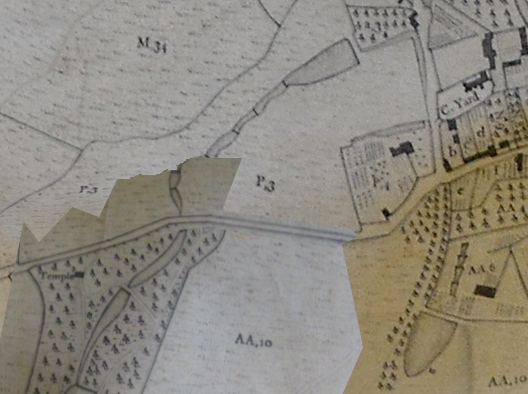 This was the grand plan of Sir Charles Kemeys-Tynte (1710 -1785) and, almost certainly, his landscape designer the famous astronomer, mathematician, architect and landscape designer Thomas Wright (1711-1786), of whom a lot more will be written in these pages in due course. 1771 Estate map by William Day. The roadside cascade is on the southern side of the road that passes the northern end of Mill Wood, near to where the Temple of Harmony is marked on the left of this map. The whole scheme of Mill Wood is a single holistic entity, however with so much happening right now at every stage with the Halswell built landscape I’m going to have to discuss each part separately for fear of losing readers through weight of detail! The roadside cascade, as we call it, is the termination of these man-made eighteenth-century waterworks before they return the water to nature. This was not always the case however, all the historic maps right up to the twentieth century show that the important economy of fisheries was still being used by trapping the stream’s water into separated locks that followed the course of the stream along the field to the north. This ancient practice was likely performed in Mill Wood itself before Sir Charles’ time. The economy of a medieval estate would not leave this resource untapped and it may be to the lay monks of Taunton Priory that this task fell. We know that at least some of Halswell Manor’s land was leased to the Priory in 1285, for how long before this date and for how long after we are still trying to establish. However the Priory generated wealth and sustenance by developing and maintaining fisheries, or vivaria, at sites often removed from the mother ship in Taunton. Vivary Park in Taunton is built upon and takes its name from Taunton Priory’s main vivaium in the town. Whether Mill Wood was part of this fisheries economy for Taunton Priory is, and may remain, unknown. 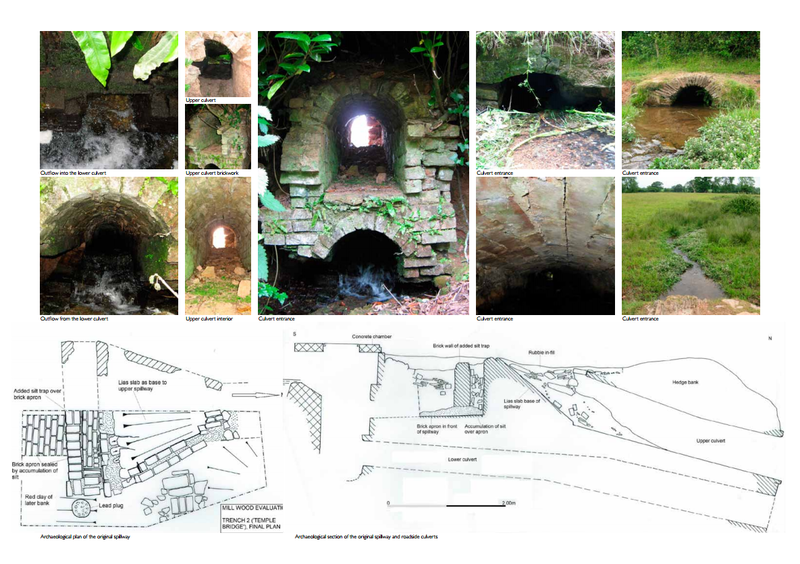 But the management of water on the site has a provable tradition back to its recorded use as a mill in the 1597 survey of the estate. 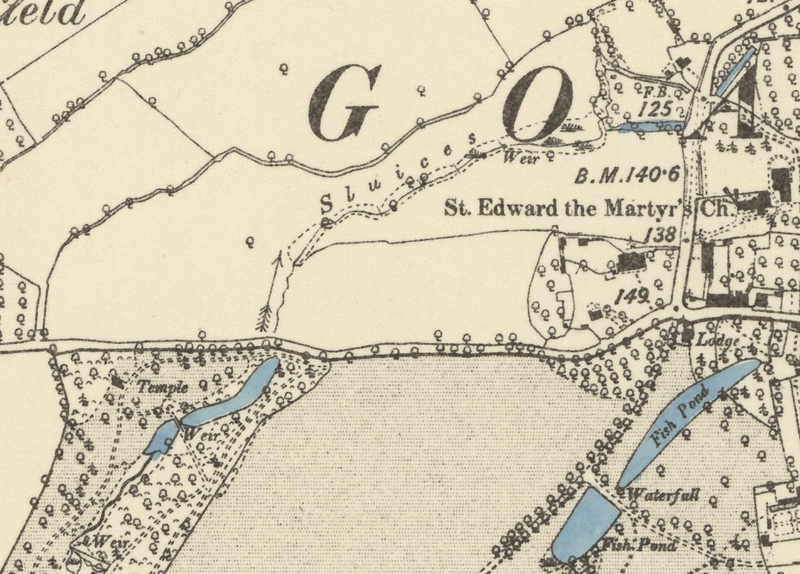 1887 Ordnance Survey Map with the position of the roadside cascade to the immediate north of Mill Wood, the water flow and associated remains of the old weirs or sluices weave north east toward St Edward’s Church, Goathurst. But it was Sir Charles, and almost certainly with Thomas Wright, who created the current water outflow from the decorative lake system which passes under the road and across to the north field. Though the fisheries and weirs on this side have disappeared the landscape architecture of Mill Wood is still very much in evidence and working as it was intended: well, almost. 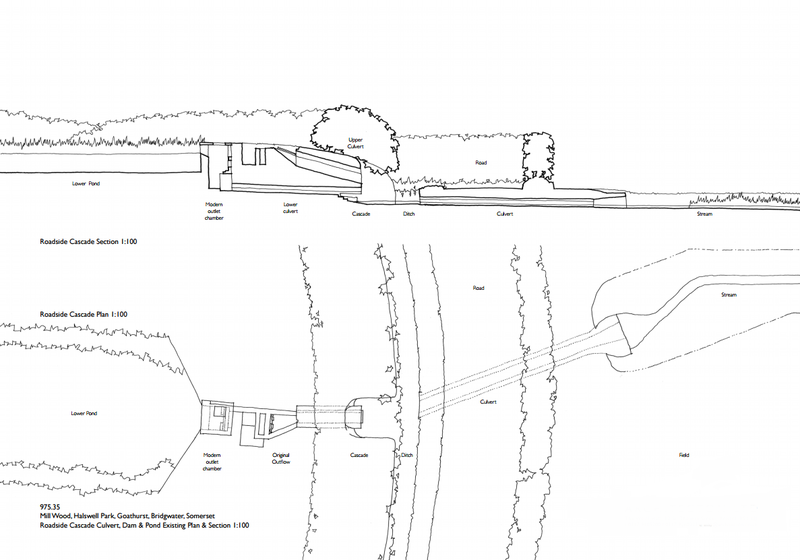 The water culvert from Mill Wood was designed not just to pass under the road invisibly, which would have been a simple solution to managing the water. 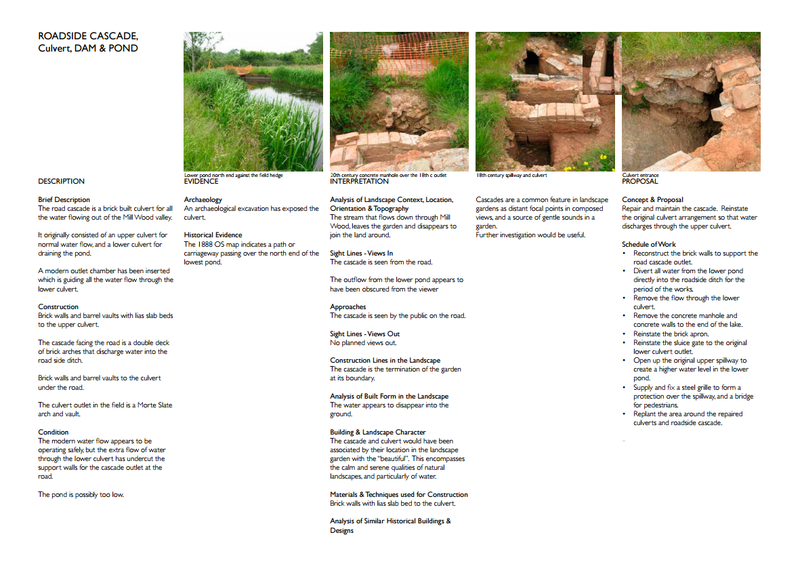 It was instead built so that the water would cascade out visibly from the hedgerow and fall into a pool beneath before disappearing from view under the road surface, benefiting the passing traveller and creating a fountain of fresh water for the village. The decades of neglect that befell Mill Wood and the introduction of mains water into Goathurst left this small but interesting feature to become overgrown, forgotten and latterly to collapse. 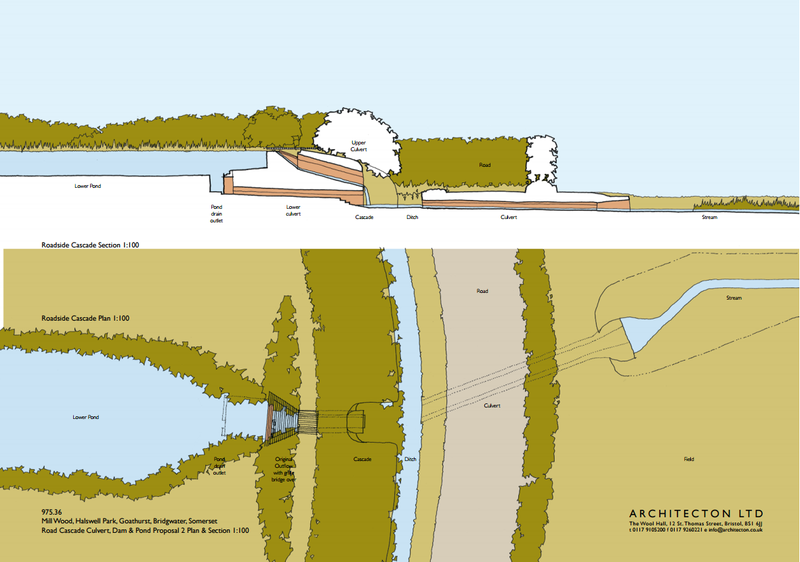 A modification to the water flow itself by the construction of a new concrete basin at the foot of Mill Wood sometime in the mid-twentieth century stopped the water flowing out from the top spillway, reducing the visual impact of the original water cascade. The water currently flows through the lower spillway which was intended for intermittently draining the lake only. Planning permission is now underway so that we can start repairing this decorative element of the village and restore this small, simple but bucolic public face of the Mill Wood lakes. This is fascinating. I had no idea that this valuable water supply was shared with the village in this way. I hop that can continue.